In 1915, the ‘Bohr Model’ (also known as Bohr Atomic Model) was proposed by a scientist named Niels Bohr. This model would change the way we understand the atomic structure of hydrogen. He was able to use research that indicated hydrogen emission spectra to explain how electrons interacted with the nucleus of an atom. This achievement was vital to the growing field of chemistry and would help to show how atoms were able to maintain a stable state. In the early 1900’s, a Danish scientist by the name of Niels Bohr was working under Ernest Rutherford to study atomic structure. With their experiments, they were able to discover the positively charged nucleus surrounded by a dense cloud of negatively charged electrons that was present in all atoms. Combined with the earlier discovery of the electron, this was a monumental step in physics and chemistry. There was, however, a problem. Because Rutherford was unable to pinpoint the exact movements of atomic particles, he was unable to show the proper movement of electrons in an atom. Eventually, he decided to introduce the theory that electrons moved around atoms in a circular pattern, similar to the way in which planets move around the sun. While this theory was utilized for the time, Niels Bohr realized the implications of such a statement and knew that this couldn’t be true. He began to work to put forth an answer that would properly explain the relationship between electrons and the nucleus of an atom. Why Couldn’t Rutherford’s Proposed Theory Work? Niels Bohr was working with Ernest Rutherford to learn more about atomic structure and the interactions of atomic particles. When Rutherford discovered the positively charged nucleus of atoms with his gold foil experiment, he was challenged by the need to put forth a theory about how electrons interacted with the nucleus. Eventually, he would suggest that electrons interacted with the nucleus of an atom much like planets stayed in orbit around the sun. Niels Bohr realized that electrons couldn’t move like planets as proposed. This is because any charged particle that moves and accelerates in orbit gives off electromagnetic radiation. If electrons orbited in such a manner, they would eventually begin to spiral faster and faster, while giving off energy and decreasing the size of the orbit. 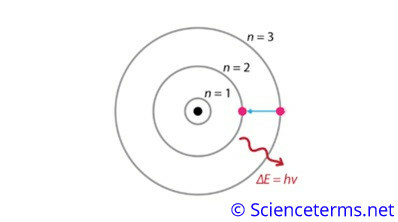 If electrons did move in this suggested patter, it would cause electrons to spiral into the middle of the atom and become unstable, likely annihilating the entire atom. This was obviously an unacceptable model. If it was true, it would predict that all atoms were unstable and would eventually collapse. Because of this realization, Bohr started wondering how electrons were able to maintain an orbit around the nucleus without becoming attached to the protons and collapsing the atom. He began to research as much information as he could regarding the behavior of electrons. Eventually, Bohr would realize that if electrons orbited the nucleus of an atom similar to the way planets orbit the sun, he would be able to confirm their orbital tendencies by examining the light emissions from the atoms. He chose to examine hydrogen to confirm his theory. He knew that if electrons behaved as Rutherford expected them to behave, they would have a smooth, uninterrupted emission of light. After examining research and testing his hypothesis, however, Bohr realized that hydrogen atoms didn’t give off a smooth emission of light. There seemed to be discrete units of light that were emitted from the spectra. This led Bohr to the belief that electrons couldn’t simply orbit in a circular pattern around the nucleus – they must be jumping. After several years of research, Bohr was finally ready to present his atomic model. The model was based off of hydrogen and the light that hydrogen atoms emitted. It is important to note that while the calculations of the model are correct and do explain the relationship electrons of all elements have with the nucleus of an atom, this model is based off of hydrogen and is specific to the way the electron in hydrogen’s energy shells work. The above graph shows how hydrogen’s electron moves. Bohr was able to determine that electrons existed inside energy shells because of the discrete units of light he observed from hydrogen’s light emissions. By using light wave research from other scholars and conducting experiments of his own, Bohr was able to determine that there were multiple energy shells surrounding an atom and that each energy shell could hold a certain number of electrons. Bohr realized that each energy shell (n) could contain 2n(2). Therefore, the first energy shell can only contain 2 electrons, while the second energy shell could contain up to 8 electrons. This pattern continues for all the energy shells. Bohr realized that electrons were able to move from energy level to energy level. This allows them to remain in a stationary state without having to radiate energy as they orbit the nucleus. Electrons stay inside their energy level unless they emit a photon of energy or gain a photon of energy. Emitting a photon of energy enables electrons to move down a level, while absorbing energy allows them to move up a level (or several levels). This realization helped to explain both the discreet units of light that were found to be emitted from hydrogen samples, as well as the stable nature of atoms. It also served as an approximation of how larger atoms helped to maintain their stability. 1. How do electrons differ from planets? A. They are able to jump between energy levels. B. They are confined to a single orbital path with no variation. 2. How many electrons can the first energy shell hold? 3. What serves as definitive proof that electrons don’t use planetary orbits? A. Hydrogen only has one energy shell. B. Hydrogen doesn’t give off a smooth emission of light – it gives off discrete units. C. Hydrogen is an unstable unit.